Patented ManureMagic™ is highly concentrated and utilizes millions of micro bio-reactors to deliver hundreds of billions of live microorganisms that consume solids associated with animal production. 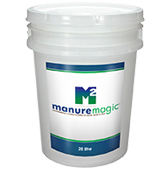 ManureMagic™ will significantly reduce solids, crusting, gas build-up and odour. ManureMagic™ will deliver all these benefits without any adverse impact to the environment. ManureMagic™ delivers live microorganisms that consume solids associated with animal production. Through its unique patented micro bio-reactor, these organisms directly neutralize the key health and environmental problems animal waste can cause. If you’d like to learn more about ManureMagic™, you can download a copy of our latest brochure. Field trials were held at a pig farm in Iowa, USA, in August 2012. The results revealed ManureMagic™ superior to alternative liquid treatments in 5 key ways. Delivers more than 100 times higher microbial counts than traditionally found in other microbial products. Greatly reduces costs associated with pumping pits, lagoons or tanks. Manure odours are slashed by 70%-75%. Eliminates methane build-up, thus increasing farm safety. This video highlights the benefits of DryLet’s ManureMagic™ including its environmentally friendly control of odour, solids, crusting, and gas and foam build up. ManureMagic™ is available directly from Velocity Chemicals to poultry and livestock farmers across British Columbia only. To order, call one of our specialists today at 604 881 4700.